The European Commission has cleared under the EU Merger Regulation the proposed acquisition of SABMiller, the world's second largest brewer, by AB InBev, the world's largest brewer. The clearance is conditional on AB InBev selling practically the entire SABMiller beer business in Europe. Commissioner Margrethe Vestager, in charge of competition policy said: "Today's decision will ensure that competition is not weakened in these markets and that EU consumers are not worse off. Europeans buy around 125 billion euros of beer every year, so even a relatively small price increase could cause considerable harm to consumers. It was therefore very important to ensure that AB InBev's takeover of SABMiller did not reduce competition on European beer markets." The Commission had concerns that the transaction, as initially notified, could have led to higher beer prices in Member States where SABMiller is currently active, because it would have removed an important competitor and made tacit co-ordination between the leading international brewers more likely. By offering to divest practically all of SABMiller's beer business in Europe, AB InBev has addressed these concerns. The proposed transaction would bring together AB InBev, the world's largest brewer, with SABMiller, the world's second largest brewer, creating a global market leader. AB Inbev's brands include Corona, Stella Artois and Budweiser. SABMiller owns brands such as Miller, Peroni, Pilsner Urquell and Grolsch. At global level the merged entity will sell twice as much beer and earn four times more profit than Heineken, currently the third largest brewer, and five times more beer and 12 times more profit than Carlsberg, currently the fourth largest brewer. In Europe, where Heineken and Carlsberg are the market leaders, the merger brings together the third and fourth largest brewers by volume. Currently, AB InBev holds strong market positions in Belgium and Luxembourg. AB InBev is also present in Eastern Europe through Molson Coors, AB InBev’s long term licensed bottler and distributor. SABMiller holds strong positions in particular in Poland, Czech Republic, Slovakia, Hungary and Romania. in Italy, the Netherlands, the UK, Romania and Hungary the merger would have removed an important competitor either at the level of the overall national beer markets or in important market segments. In addition, this reduction of the number of competitors would have also increased the likelihood of tacit price coordination. The investigation revealed documents and country specific evidence in several Member States indicating that European brewers seek where possible to engage in coordinated "follow the leader" type pricing at national level. Under this approach, the market leader takes the initiative of price increases in the expectation that its rivals follow. If a rival deviates from those expectations, its competitors may then retaliate against it. Through this pattern of pricing, beer brewers may seek to achieve higher prices than would have otherwise prevailed. in the Czech Republic, Hungary, Romania and Slovakia, the transaction would have created a substantial link between Molson Coors and the market leader AB InBev/SABMiller.AB InBev is active in these countries through its licensed bottler and distributor, Molson Coors. As a result of the merger, Molson Coors would have therefore had fewer incentives to compete against SABMiller. In addition, the likelihood of tacit coordination would have been reinforced. the transaction as notified would have likely facilitated tacit price coordination among brewers in the European Economic Area (EEA) through an increase in the number of multimarket contacts. The merger of two of the four largest brewers in the EEA would have significantly increased the number of national markets where the merged entity and the two remaining major supranational brewers would encounter each other as competitors. Fewer players, encountering each other in a higher number of markets, would have found it easier to tacitly coordinate on prices at national level. The increase in the number of multimarket contacts could also have facilitated retaliation to any price reduction by a rival, including in a country other than the one where the price deviation took place. The Commission found specific evidence of brewers considering such multimarket retaliation options. Given this background and the oligopolistic structures of beer markets in Europe, the Commission had concerns that, absent a comprehensive remedy, the merger would have made price coordination easier and more sustainable. AB InBev offered from the outset to divest the whole of SABMiller's business in France, Italy, the Netherlands and the UK to preempt possible concerns of the Commission in those countries. For this package of assets the company has already accepted an offer from the Japanese brewer Asahi. To dispel the additional concerns identified by the Commission during the preliminary investigation AB InBev also offered to divest SABMiller's business in the Czech Republic, Hungary, Poland, Romania and Slovakia. 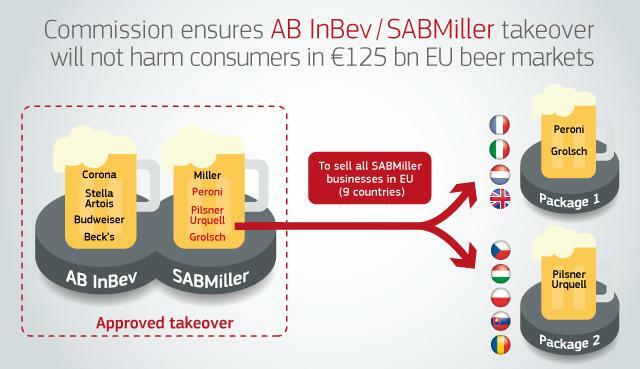 These commitments taken together address all the Commission's competition concerns, including those based on an increased number of multimarket contacts, as AB InBev has committed to divest essentially all the European businesses that it initially planned to acquire from SABMiller. The Commission's decision to approve the deal is conditional upon full compliance with the commitments. In view of the remedies proposed, the Commission concluded that the proposed transaction, as modified, would no longer raise competition concerns. Indeed, following the transaction, the intensity of competition in the European beer markets will remain unchanged. The transaction was notified to the Commission on 31 March 2016. More information will be available on the competition website, in the Commission's public case register under the case number M.7881.